I found subjects there for hundreds of pictures. Wow – great shots all of them. A beautiful area with many photo ops. Love especially that last shot. 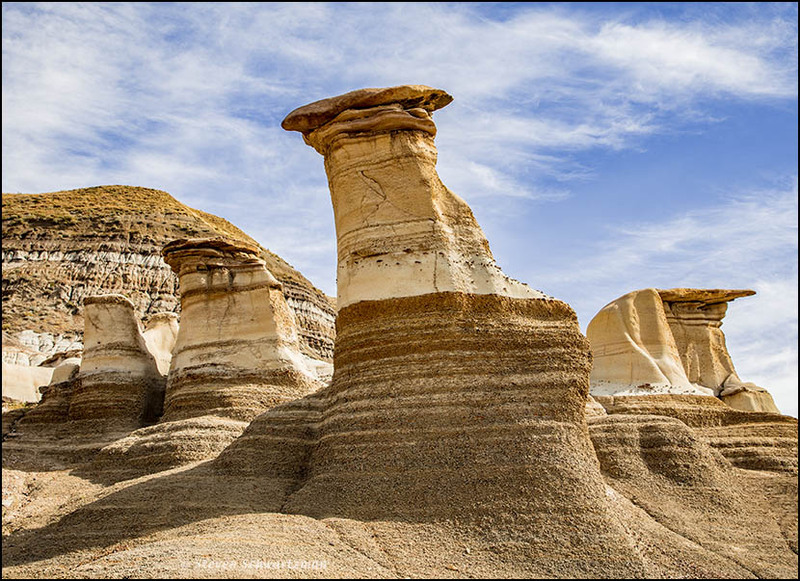 The last picture shows what I believe is the most-visited site in that area, the hoodoos. It’s a challenge to photograph for two reasons. (1) People are almost always there. (2) The authorities have put in stairs and rails to keep visitors from climbing and walking on the hoodoos. I had to avoid including both the people and the constructed objects, and I was blocked from being in some of the places where I wanted to stand. This is the kind of situation I hate. I avoid that as much as I can. You did well anyway. On our first visit to the site a few weeks earlier the place just swarmed with visitors. By September 12th the tourist season was winding down and the hoodoos weren’t as mobbed. On both visits I managed to get some good pictures but I had to work for some of them. Thanks. I just discovered that WordPress put your comment into the Spam folder. That’s why I was so late replying. Good area for hunting dinosaur bones. You can tell that I did too. Having seen the badlands in South Dakota and Alberta, I’d like to check out the ones in North Dakota. Then we can both be bad boys of the badlands. Oh my! I had no idea Canada had this type of landscape! I thought it was mostly mountains and prairie. The last image is my favorite. Such wonderful golden colors, and delightful shapes! In May of 2017 we spent a day at South Dakota’s Badlands National Park, which I’d known about for most of my life but had never visited. Not long afterwards we discovered that Alberta has similar features and we made a point of checking them out on the same trip that took us to the Canadian Rockies. Alberta is definitely worth a trip, both for the mountains and the badlands. I saw your comment to David about hundreds of pictures and I can see why. So much to see. One could easily spend a week, or more, just studying all the compositional possibilities. You’d probably have taken hundreds of pictures too. Last year we spent just one day at Badlands National Park in South Dakota; now I wish I’d gone back there for a second round while we were in the area. Incredible pictures of an incredible alien landscape. That last photo is so other-worldly. I didn’t know about this area until Anabel took me there last year and now you. I wonder how many more hidden landscapes exist. Good question. 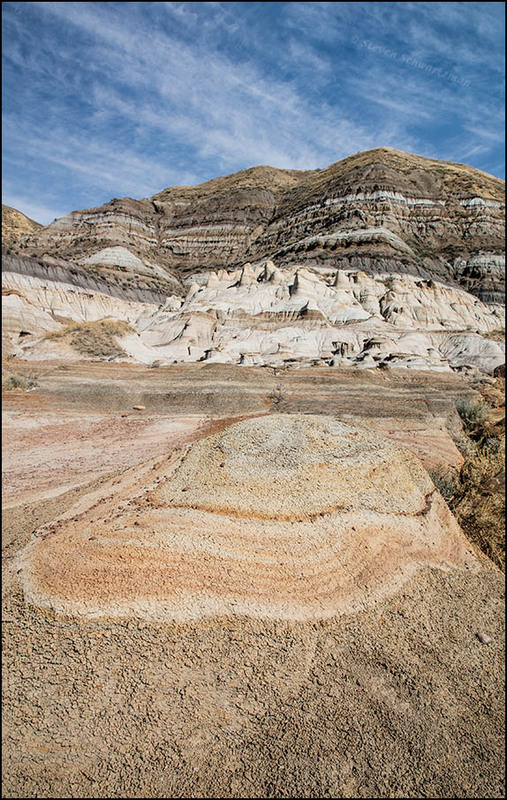 I was aware of one badlands-y site in southeastern Alberta that we never got to. I expect a bunch of others exist that I never heard of at all. I remember commenting on some of Anabel’s posts last autumn. Because we’d been there shortly before then, many of the places she showed were recent history for me. 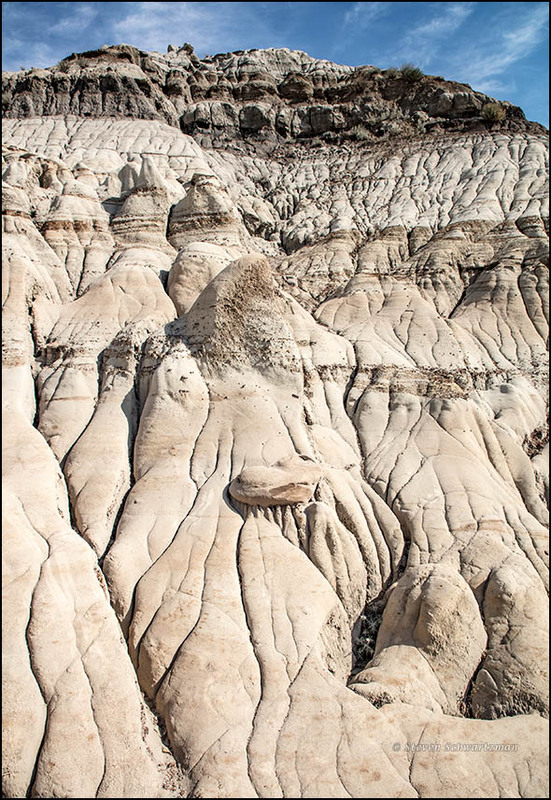 The Alberta badlands offer a bonus: the Rocky mountains are only a half-day away. We visited both of those very different geographical areas on the same trip. Fantastic series, Steve. The formations are so beautiful. I will return someday! Now that you’ve had a taste of the scenic wonders in that area, both in person and vicariously, you have good reasons to go back. What an incredible landscape and images !! I was glad I spent parts of several days in that region, which I think Americans are much less likely to have heard of than the Canadian Rockies. I never think of Canada in this way. I always see green forests and lots of lakes and such. What a nice surprise! I hadn’t thought of it that way either until last year, when a Filipina that Eve knows who lives in Calgary posted some photos from that region. At first I thought she’d traveled down to South Dakota but eventually I realized the pictures were from Alberta. The variety in the landforms is remarkable — and how lucky you were to have such gorgeous skies to set them off. It was probably airplane contrails that resulted in those clouds. Oh well, even if they weren’t exactly natural, they sure added to my pictures. I’d be willing to bet on them being natural, myself. I know contrails will spread and even show that fluffiness from time to time, but especially in the second photo the clouds have the look of high cirrus. Whichever, they are striking photos. You may be right. Either way, the fleecy clouds did add to the pictures’ textures. We visited Alberta a couple of summers ago and unfortunately didn’t have enough time to go to Drumheller. Looking at just the pictures I would never have guessed this was from Alberta. Maybe Utah or something. So neat. Most people in the United States have the same impression (including Lynda, whose comment is two above yours). Now it’s clear that even some Canadians in the east aren’t aware of some of the country’s features in the west. Amazing! Such beauty … anything but humdrum! 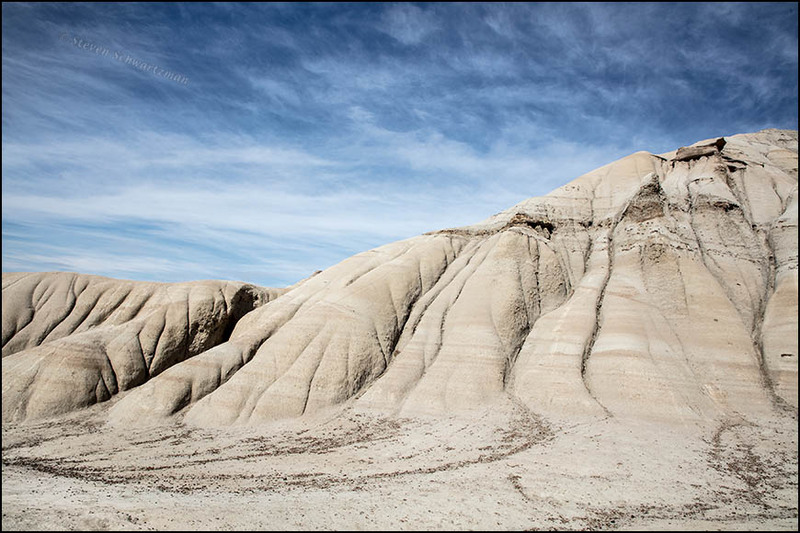 And the badlands are anything but bad, at least when it comes to scenery. Definitely not, though Badlands National Park has some even more dramatic vistas. Still need to visit there! Right. I wanted to renew your incentive. Awesome photos of a wonderful landscape, Steve. So beautifully presented. I’d love to visit myself one day. Thanks, Dina. I hope you all get there soon. Badlands National Park in South Dakota is wonderful, too.